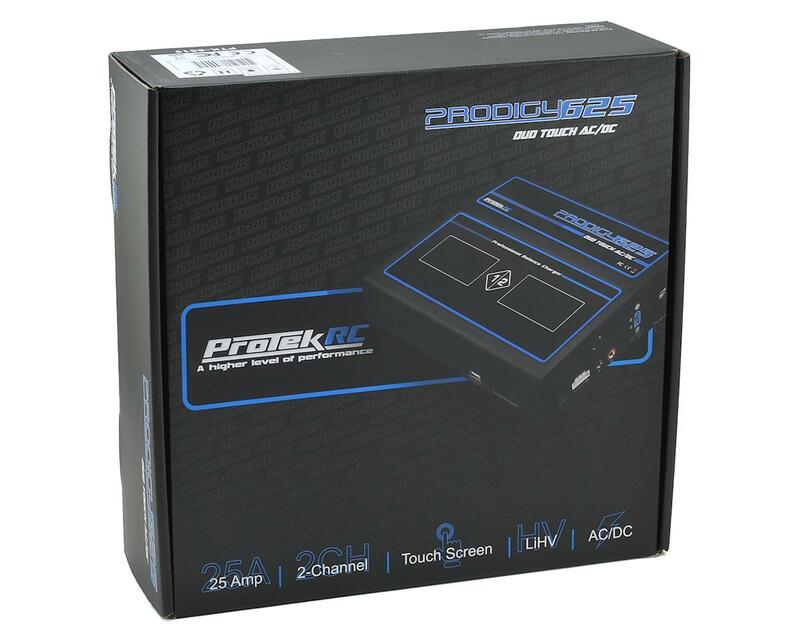 This is the ProTek R/C "Prodigy 625 DUO Touch AC" AC/DC Battery Charger. The next generation of Prodigy has arrived. The Prodigy Touch 625 DUO AC features an intuitive and easy-to-use touch screen interface with no physical buttons to wear out. 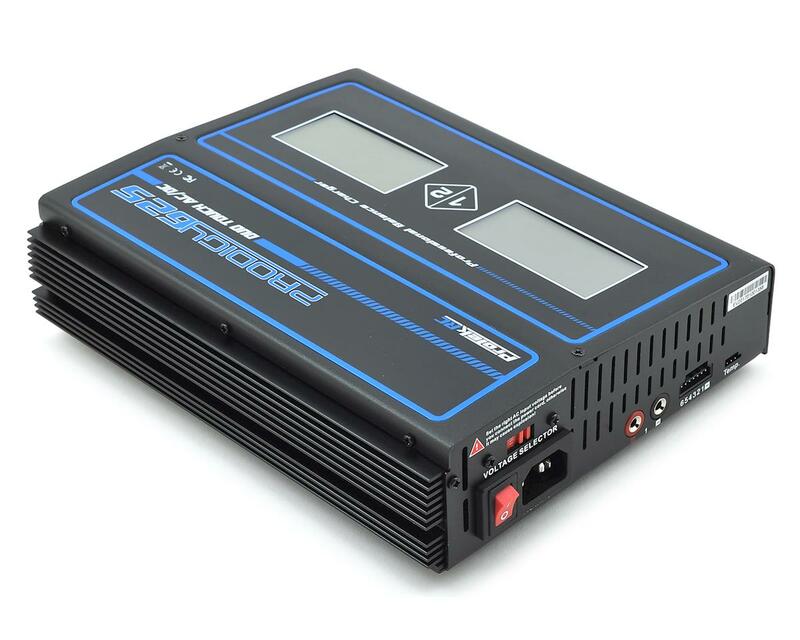 Two independently-controlled 200 Watt internal power supplies provide a staggering 25 amps of charge current - per channel - making the Prodigy 625 DUO Touch AC an excellent choice for both surface and aircraft enthusiasts. absolutely the best charger i have owned so far and my last one was the orion touch duo before it died on me( 5 months owned and no contact back from orion's customer service). the protek 625 is very easy to navigate and very simple to use which is nice compared to some out there but at the same time it also has some very complex features that arent complex to use. also 25 amps of charge rate is ridiculous for an ac/dc charger without having to lug around a huge power supply every where with you. you wont regret buying it! Excellent charger! I upgraded from a plastic Traxxas EZ Peak charger, which seems like a toy compared to this ProTek unit. The build quality is incredible (it's built like a Sherman tank as the saying goes), and the touch screen interface is excellent. The charger auto-detects the type of battery to be charged/discharged though you want to double-check mAh and charge/discharge rate. The ability to discharge at a higher rate is particularly useful since it was taking 8+ hours to discharge a fully-charged LiPo with my old charger. Overall an outstanding product and I'm very happy with the purchase. Absolutely go buy this charger!!! If you're looking for a charger that you can plug in and can charge 4s packs in about 20 or so minutes, this is the one!! !I used to have a slow charger that could only charge said 4s pack at about 3.5-4A. It took over an hour to charge that battery! Love the touch screen. Even comes with a little stylus. Multi configurations for memory enables you to save any of your settings to a specific memory setting. Recall it from the charge screen and you're good to go! Even charges LiHv. Relatively quiet for the size and how much juice it can provide. Love the dual ports. True 200w/ channel charging. You can even discharge on one side and charge on the other! MUST BUY! Have been using it for over a year with no problems. Great charger. All in one package. Fantastic charger ! Very easy to use and powerful . It's light and compact for a charger of its power. Be sure to always plug in to a surge protector as I found out the hard way a surge will blow out the internal power supply. This Protek RC charger is powerful and very complete while being very easy and intuitive to use! The measurements per cell are accurate, no abnormal heating observed so far and the ventilation is not too noisy. In short, very good product for a reasonable price. Excellent product, very easy to use. The large dual touchscreens layout is well designed and easy to read. my only complaint is the massive size of the charger. It is huge compared to my orion touch duo i was using. It takes up a lot of space on my pit table and when storing in the original box it came in it barely fits in an ogio bag standing on end. Other than that it is a great product and pretty easy to use. Best AC/DC charger you can buy in my opinion. Super easy to use, charges every kind of battery and it's just a super well built powerhouse. If you want the best, here it is. You dont know what you are missing until you get a great charger.. charges everything from my LiFe 7px transmitter battery to my liHV graphene crawler 3s batts to my monster 6500mah 4s graphene HV Protek's. 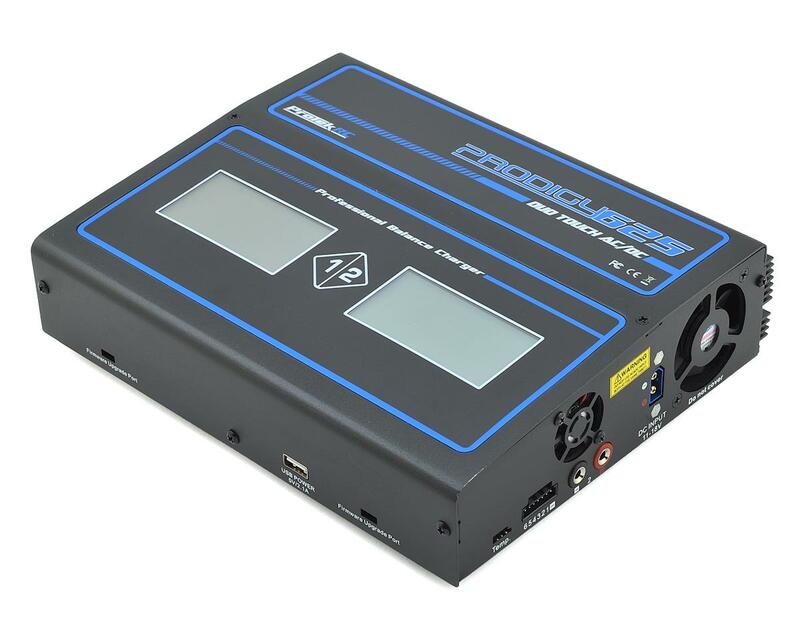 Amazing power without the need for a power supply. LIHV setting already loaded for new batteries. Great combined with the Protek charging leads! Very nice!! 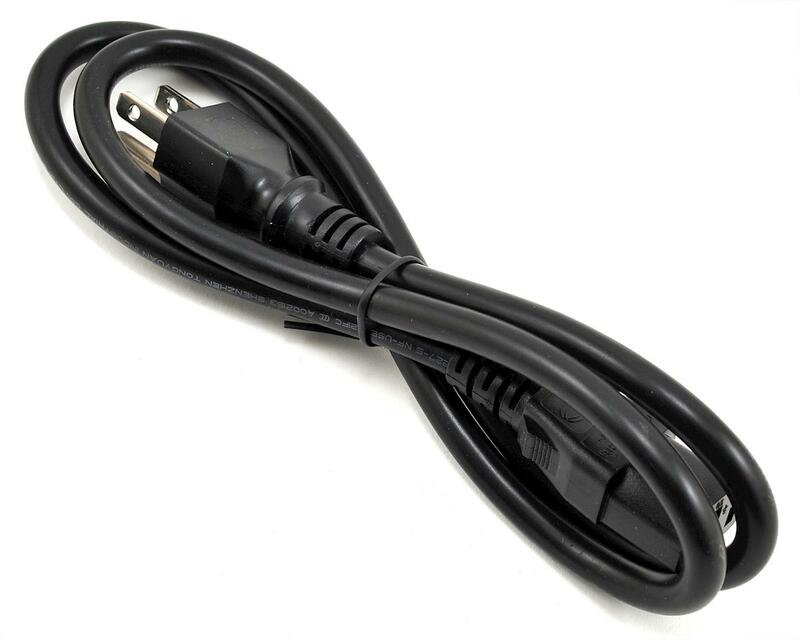 Powerful and relatively compact charger. Great for lihv charging. Quiet and very intuitive. Great job protek and Amain!!! Very happy with the charger.Its simple to use and very fast at charging.I needed a charger that could charge at a higher amperage to get the extra punch from my batteries and now I can buy the LiHV batteries as my older ProTek charger wasn`t capable of charging them.Great Price also. 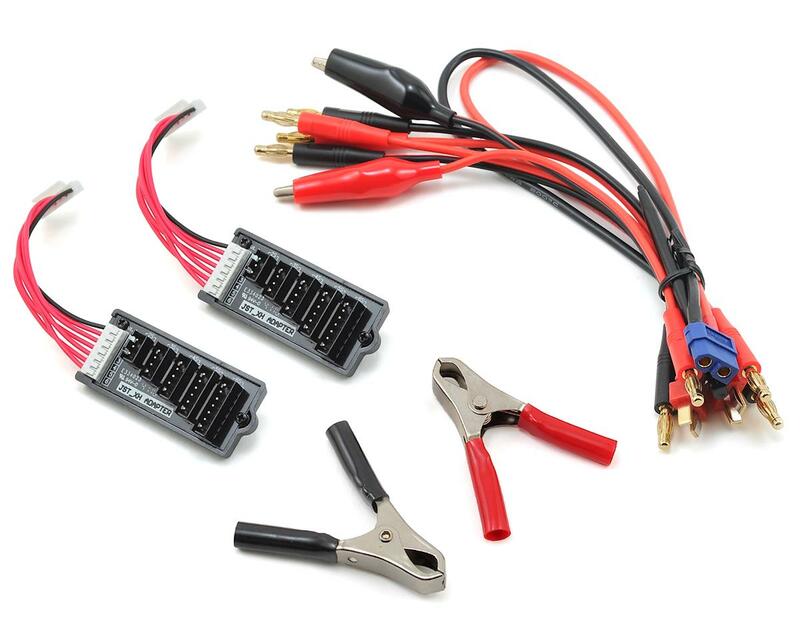 Charger arrived double-boxed from A-main..fast shipping I did my homework studied the forums for high quality RC charger that could do it all for 4S and 6S LiPO packs! This charger has a mode for every function you need! Charge/discharge/store your packs just select the battery chemistry, the sensor figures out you have 4 cell or 6 cell pack for you..charge at the recommended 1C rate..2 channels is nice charge 2 packs at once! in 45 min you are ready to play! charger does not even get warm!